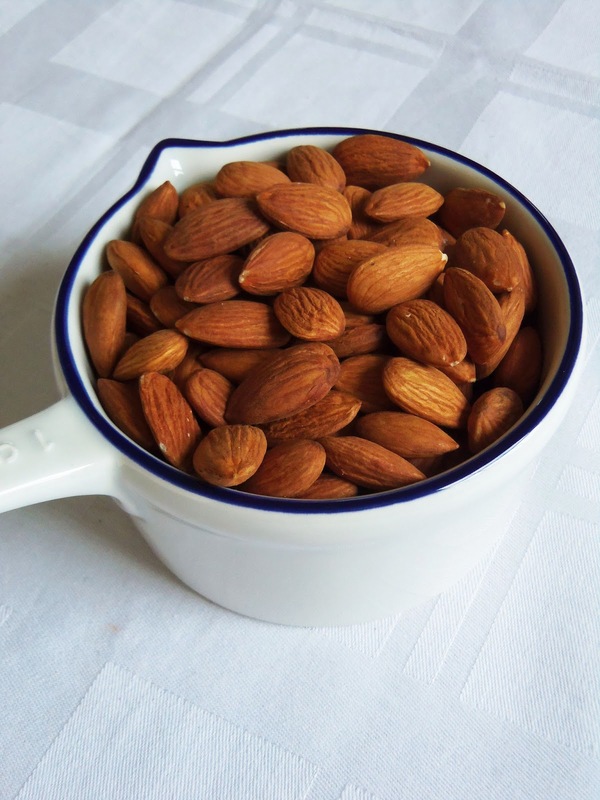 I’m in a confessional mood again: I have no self-control when it comes to eating nuts. That means – I can’t stop munching them if they are in less than a mile radius from me. They are dangerous! They’re so dangerous I usually don’t keep them in the house because I would eat them all day, every day, and they’d be gone… They’re what I call the forbidden food in our home. 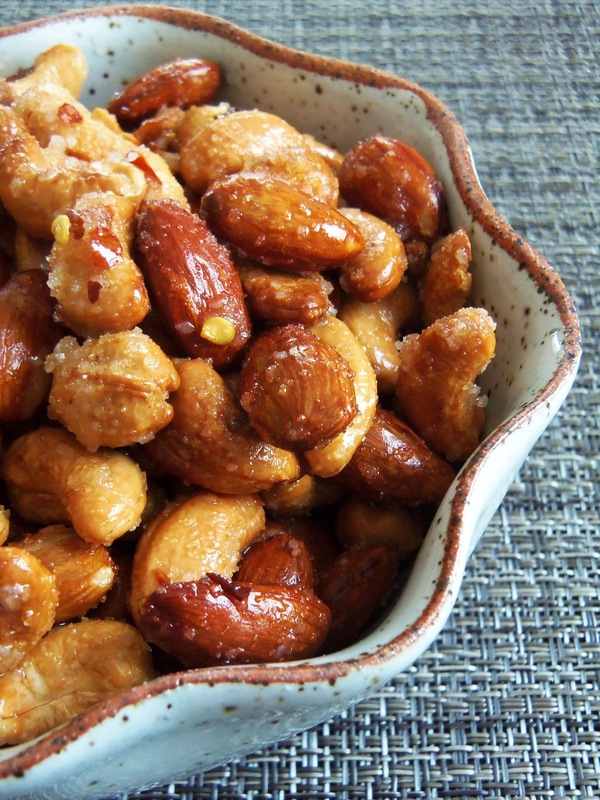 But then it happens to have company over, which implies the perfect excuse to stock up on as many pounds of nuts as possible and make these crazy irresistible Sweet and Spicy Roasted Nuts and totally impress my guests and show that I’m a great hostess. I’m a firm believer that the old custom of tipping over some dreary salted peanuts in a colorful bowl and serve them to your guests is overdone and should just go extinct. And this recipe will help you abandon that boring behavior for good and opt for something more sophisticated and exciting. 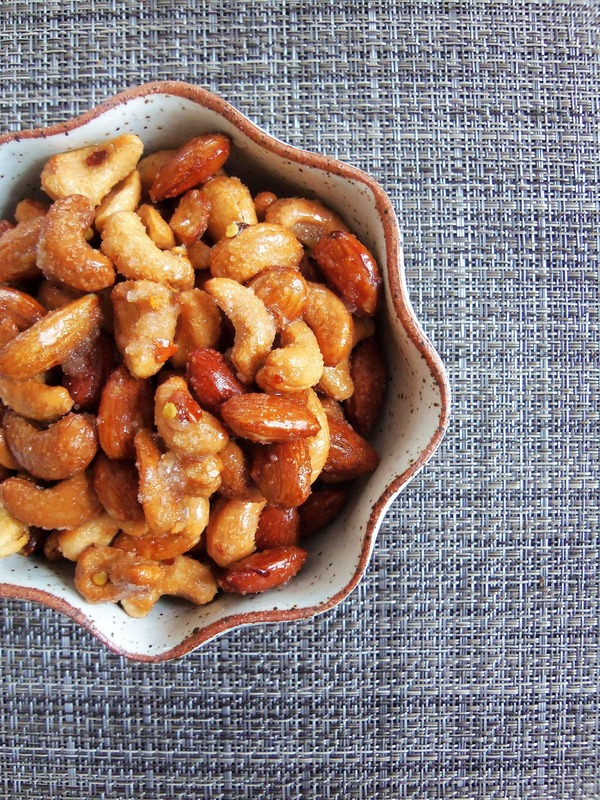 Simply put, this unpretentious mixture of crunchy, sweet, salty, a tad spicy, and a smidge unctuous equals the perfect appetizer, snack, gift or… downright addiction! Your guests will be chomping them by the fistful in no time! I dig any recipe that doesn’t require you to slave an entire day in the kitchen. 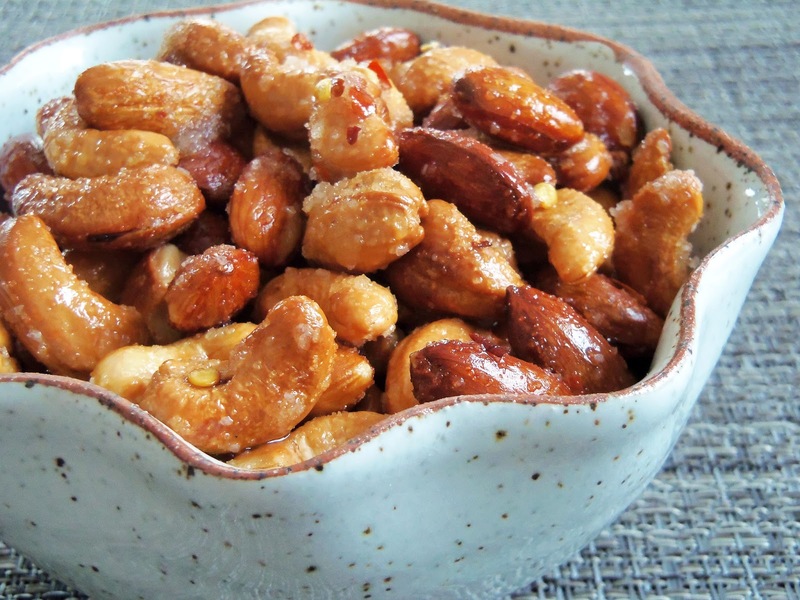 And this Sweet and Spicy Roasted Nuts recipe is right up there; it’s a breeze to whip up and uses a mere four basic ingredients to create an utterly indulgent result. 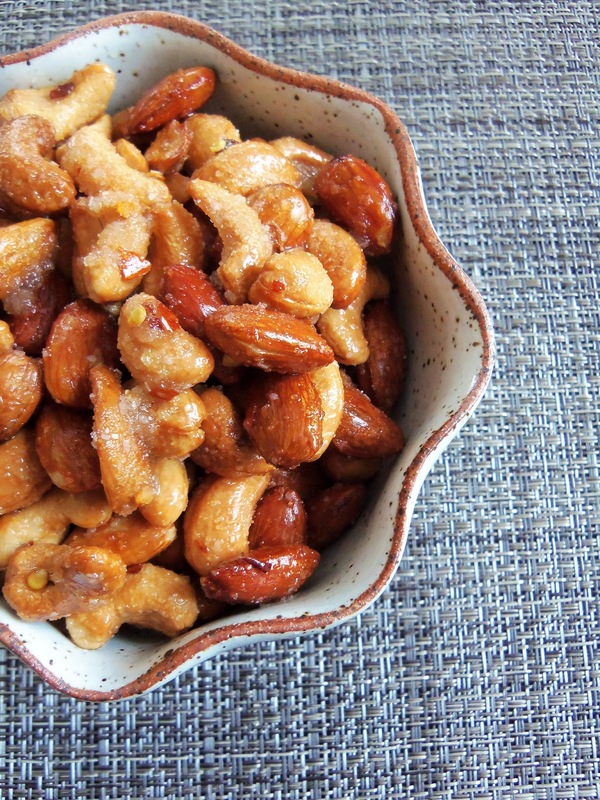 On top of that, I love any kind of nuts and chief among them, cashews. 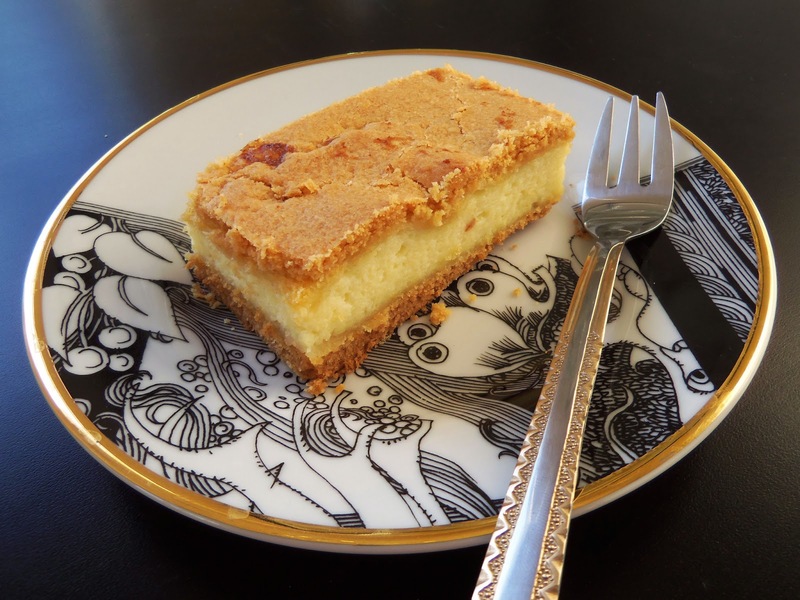 In this recipe, though, I decided to pair them with almonds for some variety. 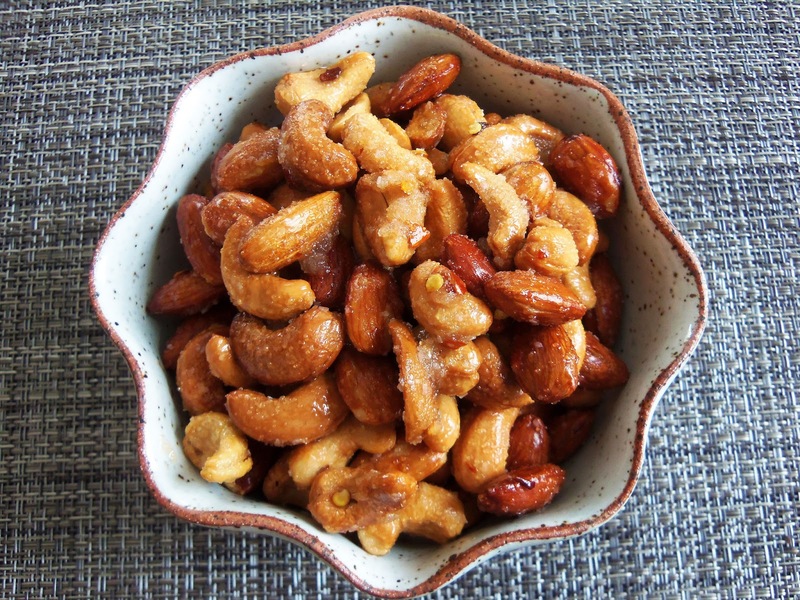 But feel free to use any kind of nuts you prefer – almonds, cashews, walnuts, pecans, peanuts, and the list goes on. Then, all you have to do is roast, mix, toss and serve. No fancy ingredients, no fancy equipment, no fancy procedures but a very fancy and infinitely delicious snack that will keep your guests happily nibbling on until the main players make it to the table. 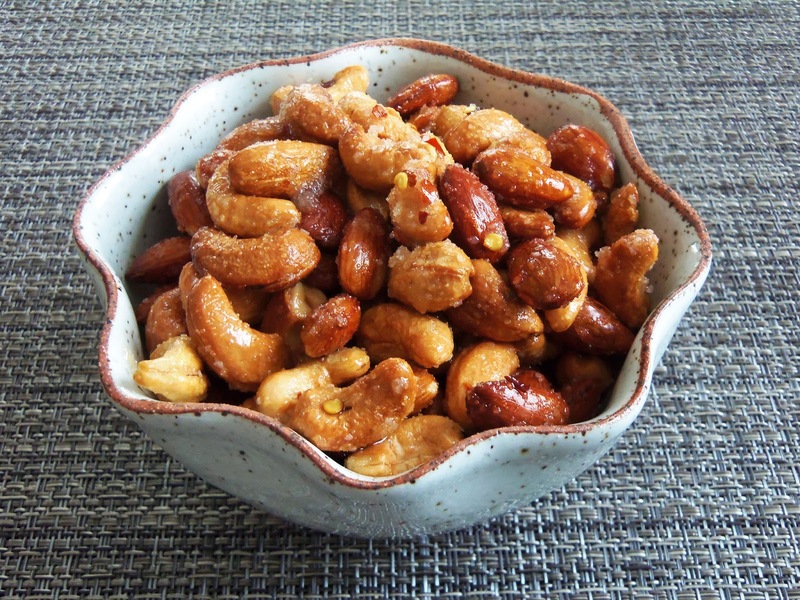 And now, though with no company around, I’m ready to dive head first into a bowl of these Sweet and Spicy Roasted Nuts. That’s right! No guests? No problem! The bowl is all yours! In a small saucepan, heat the olive oil and crushed red pepper flakes over low heat, stirring occasionally, until a thermometer inserted into the oil registers 180°F, about 4-5 minutes. Remove from the heat and let cool to room temperature, about 30-45 minutes. 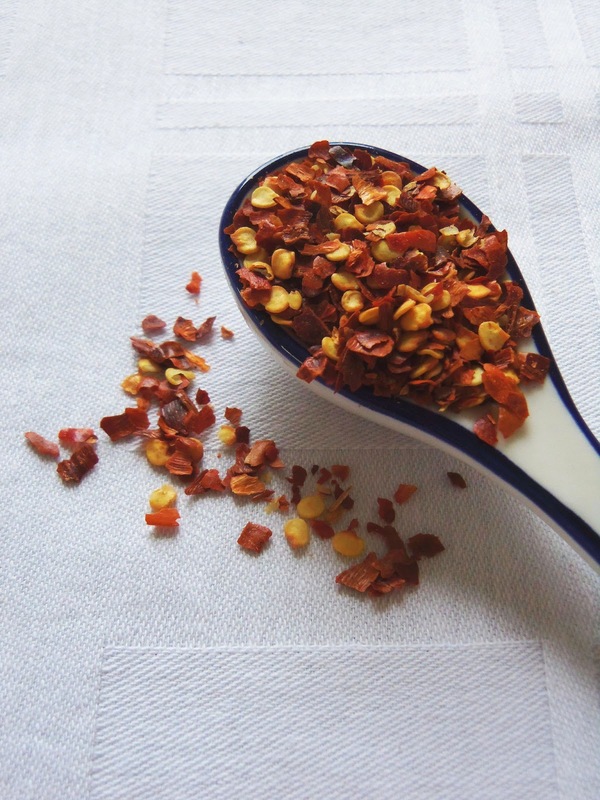 Transfer the oil and red pepper flakes to a 4-ounce bottle or other small container and seal the lid. Refrigerate up to 1 month. 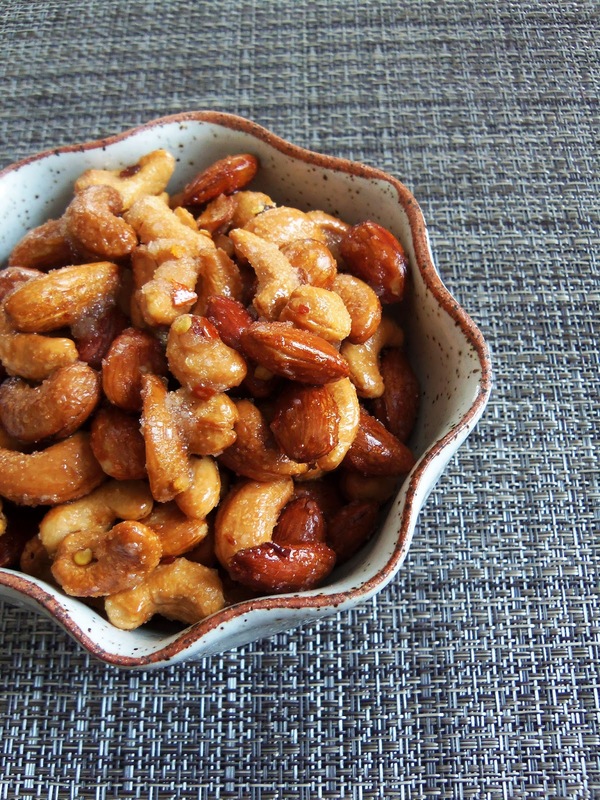 Place the almonds and cashews on a large baking sheet and roast in the oven for 15 minutes. Take them out of the oven and allow the nuts to cool completely. 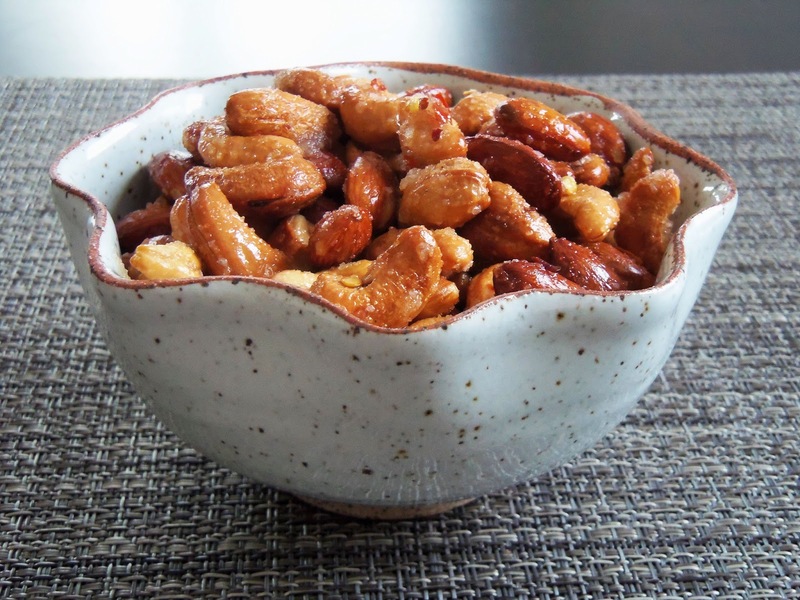 Transfer the nuts to a medium bowl. In a small bowl, stir 2 Tablespoons of Chili-Infused Oil, 1 Tablespoon sugar, and 1 teaspoon salt to blend. Pour the mixture over the nuts and toss to coat. And serve! Do you know what we celebrated on May 5? I bet everyone is thinking of Cinco de Mayo! Well, not so fast. This year, on May 5 we celebrated Easter! 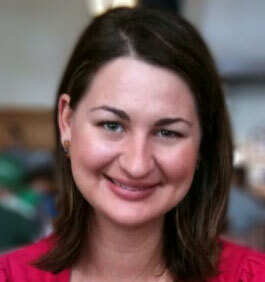 Yes, you heard that correctly – Easter – Orthodox Easter that is. So, here come the lamb… and the Romanian Cheesecake! But first things first. Few people know this but Orthodox Easter often occurs at a later date than the Western Catholic Easter does. And this year they were six weeks apart. Around this time last year, I told you how we spent Easter in Romania and the abundant menu we put together for this special holiday. 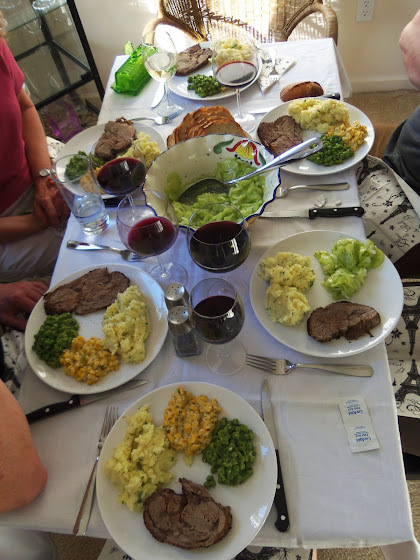 Well, we weren’t in Romania for Easter this year but we still enjoyed an elaborate menu, which included the rich, succulent lamb and a different Easter dessert. As a result, I gave the lamb a humble yet glorious treatment just as I did with the pork in this recipe, and I replaced the traditional Pască with a fabulous Romanian Cheesecake. 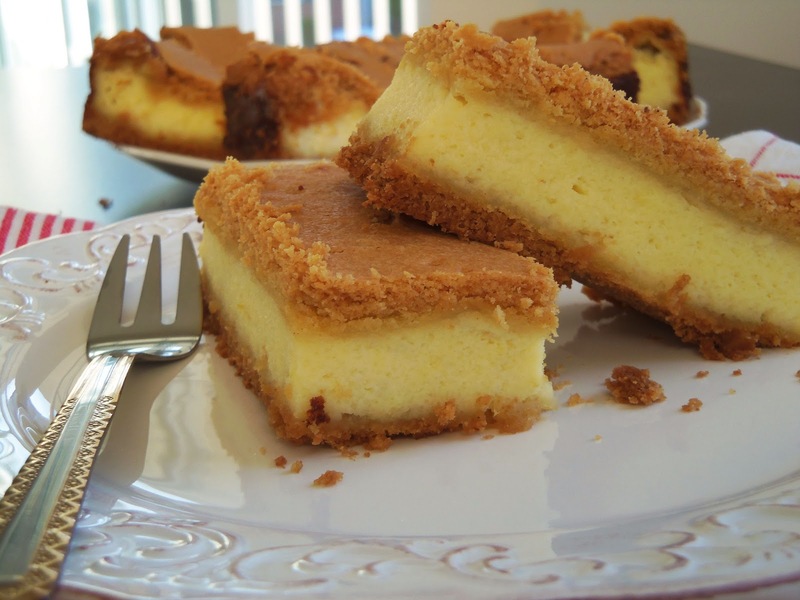 To be brutally honest, American cheesecake was never my cup of tea. Perhaps it was the obscene amount of cream cheese that this cake generally required. Or maybe it was the ratio of custard to crust that I couldn’t get over. 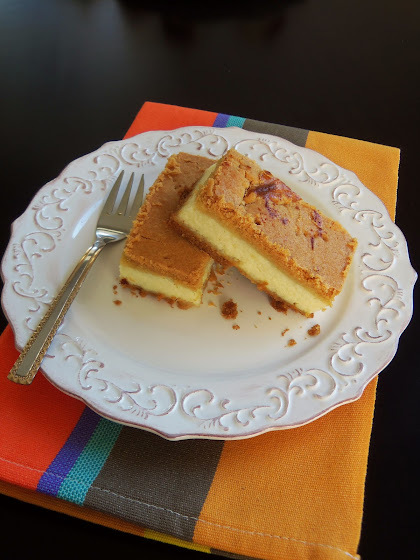 Bottom line, I always thought that I didn’t like cheesecake. But then it dawned on me that my grandmother’s cake, loaded with cheese that I adored as a kid was cheesecake, too. Yet, the difference between the two is the kind of cheese used to make the cakes. 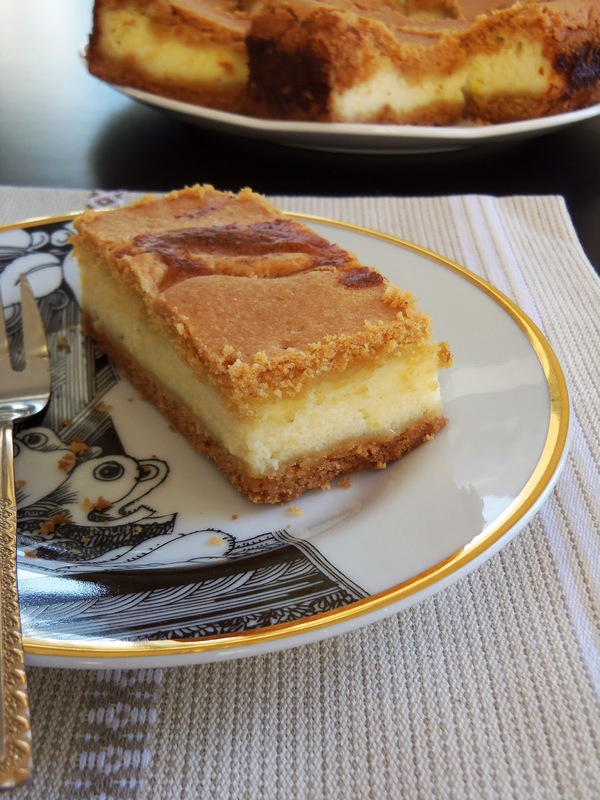 While the American cheesecake calls for cream cheese, the Romanian Cheesecake opts for a milder, less tangy cheese such as ricotta. 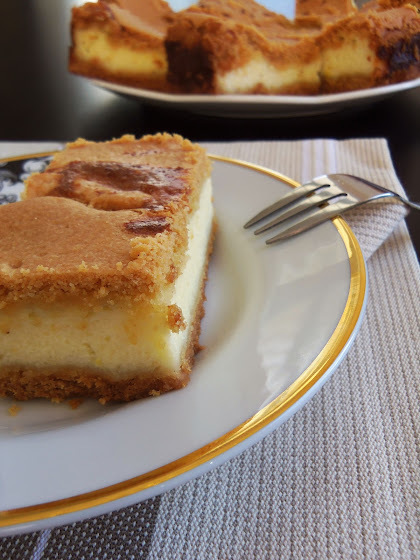 I made this fantastic Romanian cheesecake a day before Easter and since we had family friends on Sunday and really wanted to offer them dessert, Adrian and I had to restrain ourselves from devouring it before time. When you cut it into bars, you get this perfect, thumb thick, lemon speckled, rich cheese custard nestling between two delicate and pleasantly sweet crusts. 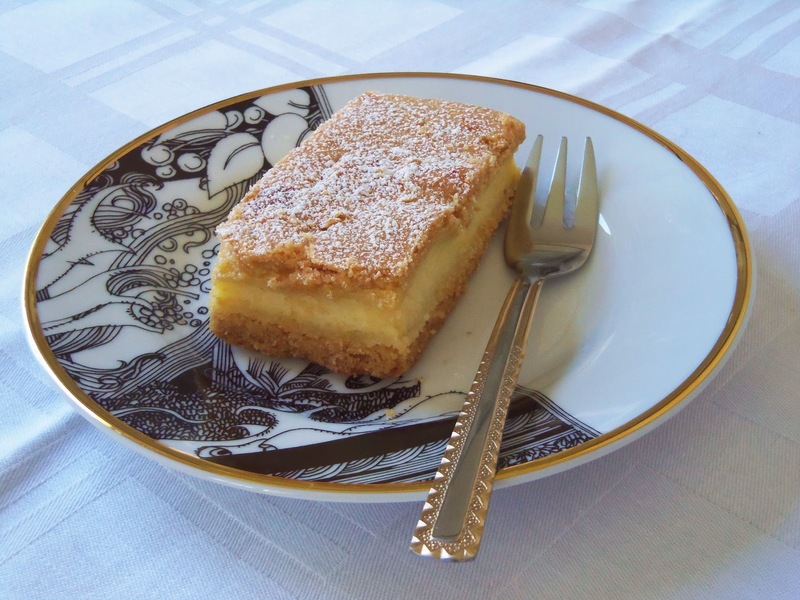 Then you dive your teeth into the soft yet firm enough top and land straight into the smooth, sweetened cheesy cream. I also love how the cream of wheat adds a slightly dense texture to the filling, while the citrusy flavor from the bits of lemon reigns comfortably in the background. And finished with a shower of confectioners’ sugar this cake is utterly stunning! 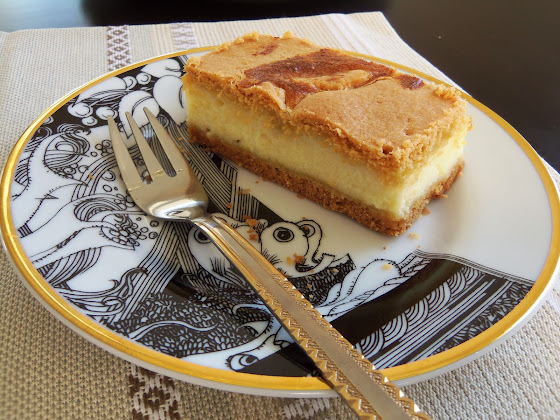 And did I mention that this Romanian Cheesecake would truly impress your mom on Mother’s Day? 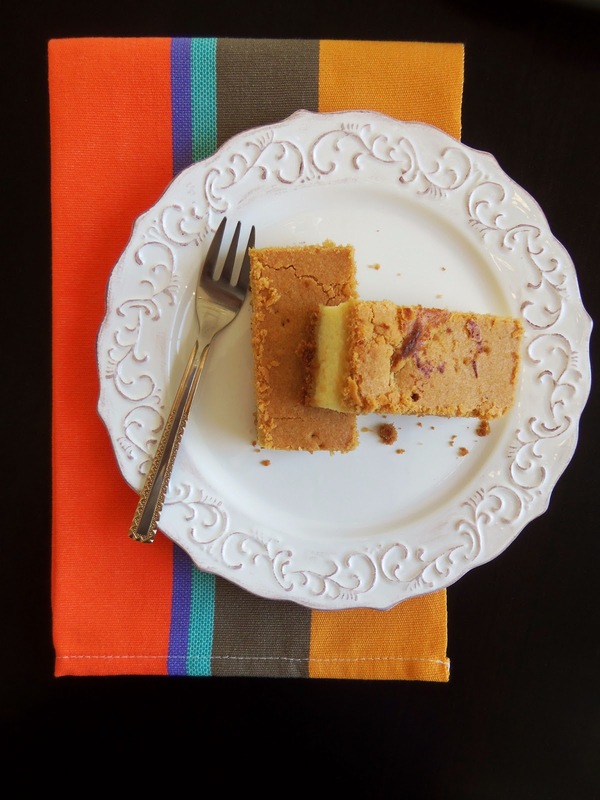 Coat the bottom and sides of a 14 x10 x 2-inch baking pan with butter. Set aside. 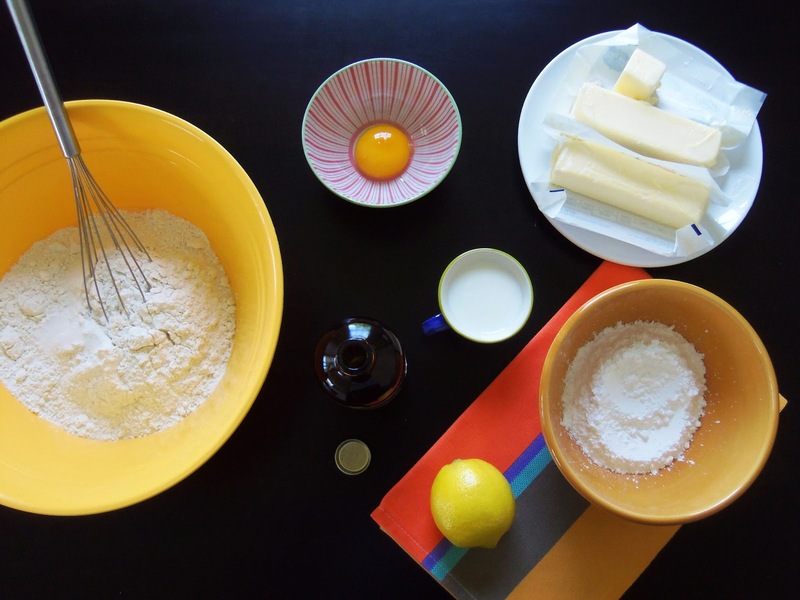 In a small bowl, mix together the baking soda and lemon juice. Keep close at hand. In a medium bowl, combine the flour and salt. Keep close at hand. 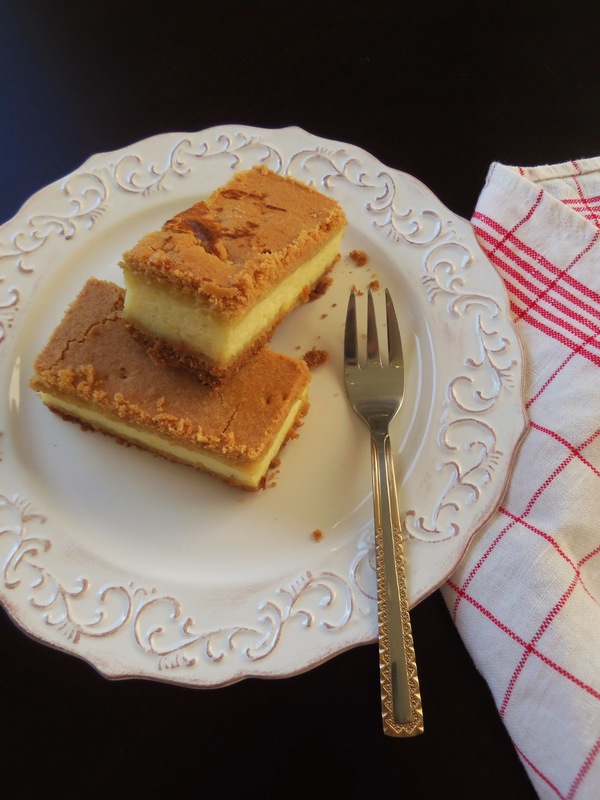 In a large bowl, using an electric hand mixer beat the butter with the confectioners’ sugar, scraping down the sides of the bowl as necessary. 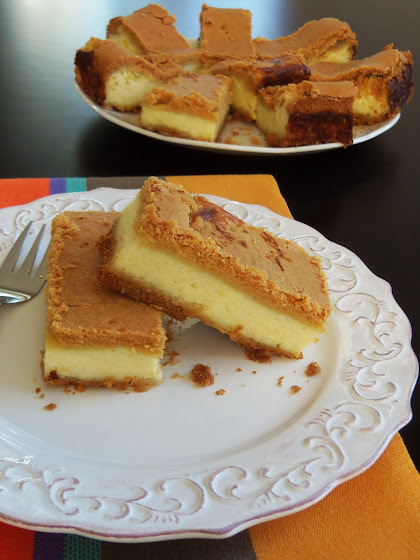 Add the egg yolk, vanilla extract, and baking soda and lemon juice mix and continue to process. Gradually add the flour and salt mixture and process until the flour is absorbed. Using clean hands, continue to mix the dough until it starts to form a ball. Add 1-2 Tablespoons of milk and mix well until you obtain a soft but not sticky dough. 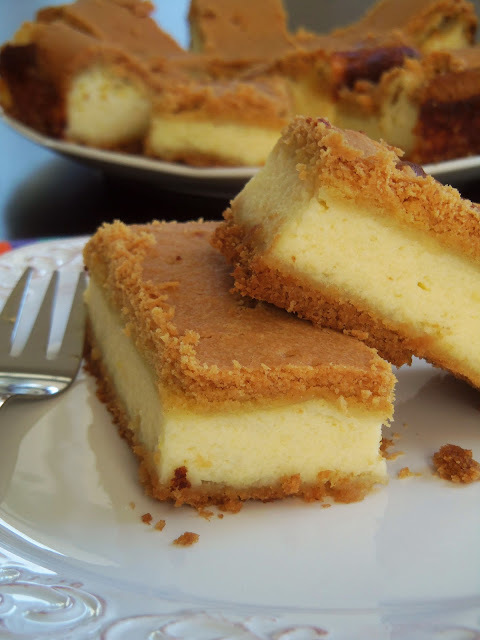 Divide it in two pieces and put them in the fridge while you work on the custard. In a medium saucepan, heat up the milk and salt over medium heat. When it gets to the boiling stage, gradually (in two batches) add the semolina flour. Turn the heat down to medium-low and stir constantly until the mixture is cooked, about 10 minutes. You’ll end up with a mixture similar to cream of wheat. Take it off the heat and let it cool completely. In a large bowl, mix the ricotta cheese with 5 Tablespoons granulated sugar and the lemon zest. Add the egg yolks to the mixture and mix well using a spatula. When the cream of wheat has cooled, add it to the ricotta, sugar and egg mixture, and stir to incorporate. In a medium bowl, using an electric hand mixer, beat the egg whites with 3 Tablespoons of granulated sugar on medium-high speed until they hold medium-firm peaks. In batches, gently fold the egg whites into the ricotta cheese mixture. Set it aside. Take one piece of the dough out of the fridge. Flour the working surface and knead the dough for a few minutes with some flour until the dough warms up a bit and becomes pliable. Roll out the dough; if you find the dough to be still too soft, roll the dough out on a sheet of plastic wrap; flatten a large piece of plastic wrap against the counter and roll the dough. Flour the rolling pin often so that the dough doesn’t stick to it. Once rolled out, transfer the dough to the prepared pan making sure it covers the entire surface of the pan. Pour the custard over the dough. The custard may seem too runny but don’t worry, it will firm up as it bakes. Take the second piece of dough out of the fridge, knead it for a few minutes with some additional flour, and roll it out like you did with the first piece. Gently place the dough atop the custard in the pan. Don’t worry if the dough breaks in places; it will come back together as it bakes. Poke the dough here and there with a fork and bake the cake for 50-55 minutes, or until golden brown. 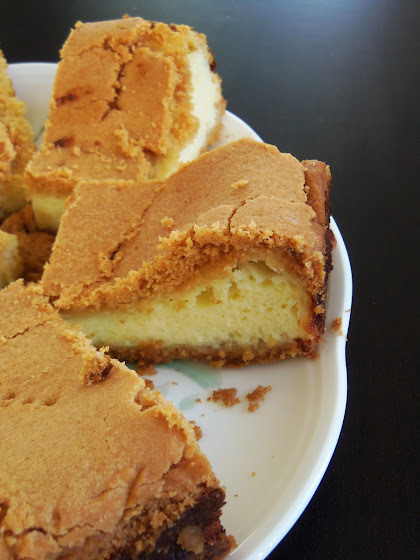 Out of the oven, allow the cake to cool completely in the pan on a cooling rack before you slice it. Dust with confectioners’ sugar.